Disclosure: Our meal was covered by Ontario’s Lake Country. All opinions are my own. Nestled on the shores Lake St John in Ramara, Tailwinds Bar & Grill is a fun eatery for aviation fanatics and lovers of great food. It is known as one of the top fly and dine destinations in Central Ontario, and the crowning jewel of Orillia Rama Regional Airport. Tailwinds Bar & Grill is only ten minutes away from Casino Rama, and is open for breakfast, lunch, and dinner all-year long. If you have been to the Orillia Rama Regional Airport before, you would likely be quite familiar with the route getting there. However, if you have not (like us prior to eating at Tailwinds), you may think you are going the wrong way. I am not sure what I was expecting – maybe the bright lights you would normally see at an airport. We were going for dinner, so the roads were dark, with twists and turns. Keep an eye out when you get close to the destination on your GPS, or you will end up in someone’s driveway. Yup… that was us. Once you get to this unique location, there is plenty of parking. The restaurant is all on one level, making it accessible for those with wheelchairs or walkers. … and Snoopy the World War I Flying Ace’s Sopwith Camel fighter plane. Very cool piece of nostalgia, that brought back so many memories of my childhood. … the song from my childhood, by The Royal Guardsman. … and the Christmas version. The restaurant is truly unique, with its cool location, warm atmosphere, and delicious menu. I can only imagine how awesome it would be to have lunch at Tailwinds Bar & Grill in the summer, and watch the aircraft take off and land. Although we loved the atmosphere, we couldn’t wait to order some appetizers. Our waitress suggested the beer battered onion rings with caramelized onion mayo. They were massive! A great shareable starter. We also got an order of the dusted chicken wings. The wings were amazing! Now it was time for our main course. Lauren ordered the Stripling Steak – chargrilled medium rare 8 ounce CAB 45 day aged steak, garlic butter smear, crispy onion straws, served with potato, carrots, and vegetable of the day (carrots, and green beans). It was cooked just the way she likes it. She loved the onion straws and carrots (her fave). Rachel ordered the Chicken Parmesan – single chicken breast pounded thin, breaded and fried, topped with roasted tomato sauce and mozzarella cheese. Served with garlic-parsley noodles, and vegetable of the day (carrots, and green beans). Rachel is a very picky eater, and loved the chicken parmesan. Wendy ordered the Beef Brisket Sandwich – 12 hour slow braised brisket, homemade bbq sauce, melted swiss cheese, and crispy onion straws, on a garlic grilled ciabatta bun. She got a side of sweet potato fries. Wendy is a big fan of brisket, and this one did not disappoint. And I ordered the Ribeye Steak – boneless 12 ounce CAB rib eye steak chargrilled to a perfect medium rare, garlic butter smear, crispy onion straws, served with potato, and vegetable of the day (carrots, and green beans). This steak was a good size, and full of flavour. Carefully curated by Chef Stephen Jackson, the extensive menu at Tailwinds Bar & Grill is sure to have something to please everyone’s palette. Give Tailwinds Bar & Grill a Try! 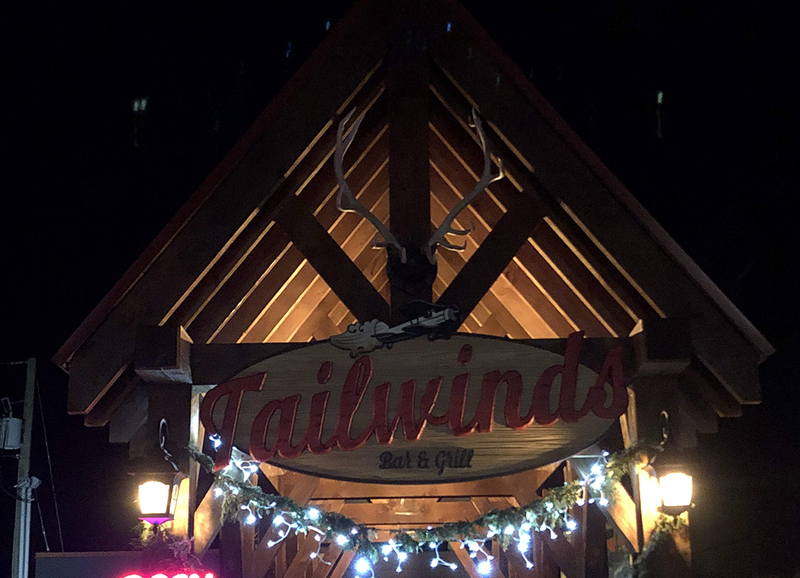 Whether you are driving by, flying in, arriving by boat, or just passing through, put Tailwinds Bar & Grill on your itinerary. The food is awesome, there’s lots of parking, the service is wonderful, and the aviation atmosphere is sure to bring back memories from days gone by.